Why are some people and organisations more inventive, pioneering and successful than others? And why are they able to repeat their success again and again? In business, it doesn't matter what you do, it matters why you do it. Start with Why analyses leaders like Martin Luther King Jr and Steve Jobs and discovers that they all think in the same way - they all started with why. Simon Sinek explains the framework needed for businesses to move past knowing what they do to how they do it, and then to ask the more important question - Why? Why do we do what we do? Why do we exist? Learning to ask these questions can unlock the secret to inspirational business. 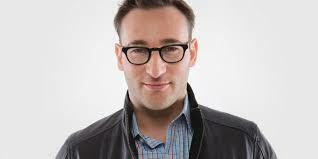 Sinek explains what it truly takes to lead and inspire and how anyone can learn how to do it. Simon Sinek teaches leaders and organizations how to inspire people.He has been invited to talk to top teams at Microsoft, American Express, the UN and the Pentagon. His famous TED talk has been viewed more than 500,000 times. He lives in New York. I usually start 12 books at once and never finish but this one held me all the way to the end. It's got sticky labels on the bits to go back to and share with my team. It's changed my thinking already and I know I have to go back and reread it to remember the nuances. Helped me to find my why and why I needed to. Applies to all areas of my life and others'. Start with Why is a great read, worth your time. It delves in to the deeper concept of why organisations exist and how this plays out for successful organisations. Simon Sinek brings a perspective to business and leadership that is easy to consume while providing a point of difference. This is a very useful book in exploring the urge behind your wish to do. achieve something - and very helpful for defining how to stay focussed and on track.